The Indian Council of Agricultural Research conducts the entrance exam which is popularly known as All India Entrance Examination for Admissions. This entrance exam is basically organized for providing admissions in various undergraduate and post graduate courses. The application form for the entrance exam will be released online on the official website of the exam conducting authority and can be filled online only. Candidates have to choose any one field or stream which is required to be chosen at the time of submitting the application form. The option which is selected once cannot be exercised again. Candidate is required to the visit the official website of the exam conducting authority. Then, the candidate has to select the application form in order to fill it which could be UG, PG or Ph.D. from. A page requiring the details of the candidates appears on the screen. Candidates have to fill the details in the application form completely and correctly. Then, the candidate will have to make the choice of how to make the payment of fee for the application form. Payment of the fee can be done through an online payment gateway, SBBJ Bank Challan or NEFT Challan. The candidate will have to submit the application. Then, an application number and password will be generated and note them for the use in future. Take the print out of challan for the payment and make the payment or make the payment online. Visit the online website again and login with the details of application number and password and update the details of fee payment. Take the print out of the application form. 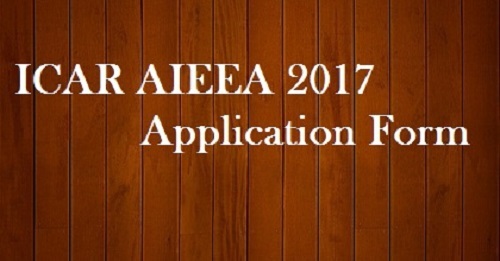 Send the printout of the application form to ICAR. Note- Candidates are advised to keep the photocopy of application form, fee payment proof, and postal dispatch proof and maintain the application form till the admission process gets over. Candidates Information- Candidates have to enter their name, Father’s name, Mother’s name, Category, and Date of the Birth of the Candidate. Choice of Exam Center- Candidates have to enter the choice of exam city as per the convenience. School Board of 12th class- The candidates are required to furnish the details of the name of the board to which their institute is affiliated. State of Domicile- Candidates are required to enter the name of state or Domicile to which they belong.